What is the best time of year to visit Takayama? What’s the weather like in Takayama month by month? Here, I’ll give you all the answers. Takayama has a temperate climate, so you can visit at any time of year. Summers (June/July/August) in Takayama tend to be hot, but evenings are cooler in summer than places like Kyoto or Tokyo. Winters (December/January/February) in Takayama can be cold and snowy. This is a good place to see snow (if that’s what you’re looking for). January is usually cold in Takayama. It’s likely to snow a few times in the month and snow might stay on the ground for a few days. Many businesses are closed from 29 December to 3 January for the New Year’s shogatsu holiday. In general, January is a quiet and peaceful time to visit Takayama. Winter weather continues into February. Temperatures are cold and skies are often cloudy or snowy. The snow might stick for a few days after a fall. The city is not crowded in February, making it a pleasant time to visit. The weather starts to warm up in March. Temperatures can vary from cold to warm, so bring clothes to deal with this (layers are best). The plum blossoms come out in mid-March and the cherry blossoms usually start to come out by the end of the month. This is a good time to visit Takayama but be warned that it starts to get crowded late in the month, so reserve accommodations well in advance. 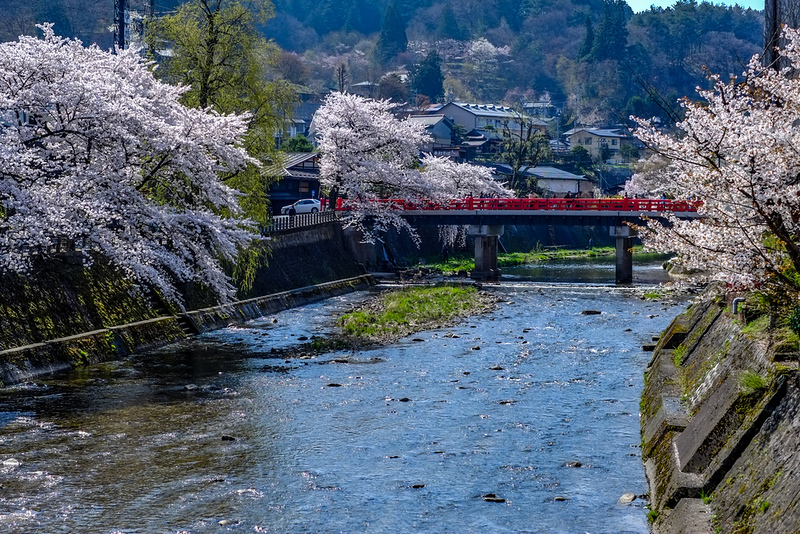 April is when spring really arrives in Takayama. The weather can vary from pretty cool to pleasantly warm. The first half of the month is when the cherry blossoms bloom, so expect crowds (and reserve accommodations well in advance). On April 14 and 15, the fantastic Takayama Matsuri is held, so if you want to visit on these days you’ll have to book trains and accommodation far in advance. The second half of April is less crowded and it’s a very nice time to be in Takayama. May is a great time to visit Takayama: The green on the trees is fresh and beautiful and there are lots of flowers in bloom. The weather tends to be warm but not hot, and the city is not that crowded. June is another great time to visit Takayama. The weather is warm but the heat of summer has not really started. It’s usually sunny, but there can be some rainy days, especially at the end of the month, when the rainy season starts. Of course, it doesn’t rain every day even during rainy season and you can visit at any time. The rainy season extends through July and the weather tends to be hot, but evenings are cooler than down in Kyoto or Tokyo. As noted above, even during the rainy season, it usually does not rain every day and travel is certainly possible during July (just consider bringing a small folding umbrella). If you don’t like crowds, July is a good time to visit. It’s also great for hiking in the nearby Japan Alps. The rainy season usually ends by early August. As soon as it ends, the temperatures rise toward the summer highs. It tends to be hot in August, but evenings cool off nicely. This is a great time for hiking in the nearby Japan Alps, but be warned that the mountains are packed during the mid-August Obon holidays. The heat of summer usually extends a week or two into September, but mornings and evenings are pleasantly cool. The skies are usually very sunny in September and the crowds are thin, making this a great time to visit. It’s also a great time to hike in the Japan Alps, with fewer crowds than in August and maybe some early fall foliage toward the end of the month. October is one of the best times to visit Takayama. The weather is warm or cool and often sunny. By the end of the month, Takayama’s fall foliage starts. And, it’s not as crowded as it will be in November. However, the city will be packed on October 9 and 10, when the wonderful Takayama Matsuri is held. If you want to visit on these days, reserve accommodations and transport well in advance. Early October can be a good time to hike in the Japan Alps, where the fall foliage will be peaking, but snow is possible during this time and many of the mountain huts will be closed. If you hike up high, be prepared for winter conditions. November is a good time to visit Takayama. The weather tends to be cool and the fall foliage peaks early in the month. The city is usually not very crowded this month. Winter weather really starts in December and it tends to be cold. Snow is possible all month and might stick on the ground for a few days. The city is not crowded in December, making it a great time to visit if you like peace and quiet. Just remember that many businesses are closed from 29 December until 3 January (however, the temples and shrines are open as usual).